This RunWenatchee-produced race is considered by many to be one of Washington state’s premier destination events because of the sights and amenities at Lake Chelan. It is a point-to-point course. Runners are transported from Manson to the start lines by shuttle. The event is a USA Track & Field certified race. Packet pickup: From 4 to 8 p.m., Friday, Sept. 9, 2016, at Vin du Lac Winery, 105 Highway 150, in Chelan; and from 5:30 to 7:30 a.m., Saturday, Sept. 10, 2016, at the North Shore Bible Church parking lot, 123 Wapato Point Parkway, Manson. On-site registration: This will only take place during packet pickup, from 4 to 8 p.m., Friday, Sept. 9, 2016, at Vin du Lac Winery in Chelan. There will be no day-of-race registration. Race shuttles: Runners will be shuttled to their start areas. The bus shuttles will leave from the North Shore Bible Church parking lot, 123 Wapato Point Parkway, in Manson early the morning of Sept. 10. This parking lot is located about a half-mile from the finish line at Manson Bay Park. Buses transporting marathon runners will leave the church parking lot at 6 a.m. sharp; half-marathon participants will leave at 7:15 a.m. sharp; and 10K runners and walkers will depart at 8 a.m. sharp. Please arrive several minutes early so you do not miss your race bus. Essentials: Aid stations will be located every two miles. Stations will have Hammer Gel, water and an electrolyte drink. The course also will have numerous port-o-potties. Trash: Leave no trace. Be kind to our beautiful lake environment and our neighborhood hosts and clean up after yourself. Please don’t abandon trash. Waste baskets will be located at each aid station. Help us keep Lake Chelan clean and green. 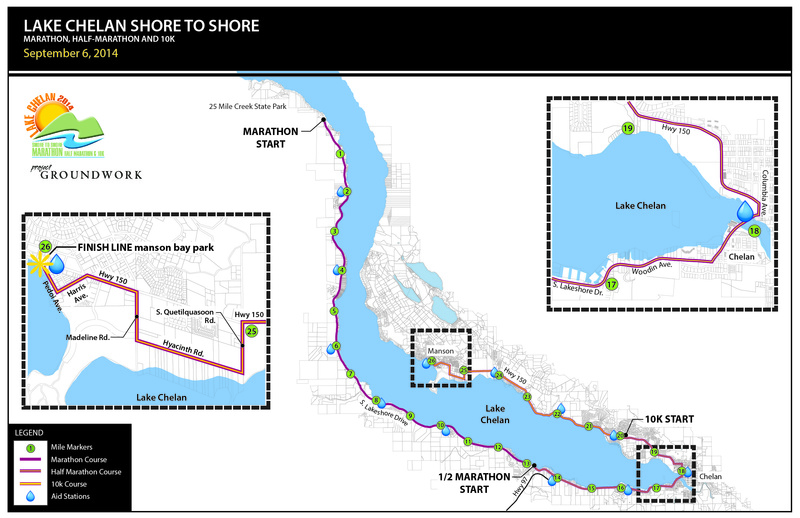 Views and features: The course is almost entirely on the roads (primarily Lakeshore Road and Highway 150) that sit adjacent to and are within feet of Lake Chelan. You will be treated to generous and amazing views of the lake as well as views of the North Cascades, the rolling foothills in the immediate vicinity, and numerous wineries. Runners also will traverse through the quaint downtowns of Chelan and Manson. Course note: The course is open to traffic. We have taken as many steps as possible to provide a safe and enjoyable event. The course will have mileage markers and will have frequent and well-stocked aid stations. Finisher’s medals: All registered finishers will receive a medal. They will be handed out near the finish line to registered participants who complete the race. Medals are not mailed to participants either before or after the race. You must have your race bib with you at the finish line in order to collect your medal. Technical shirts: All participants who register by Aug. 25, 2016, will receive a high quality, long-sleeve technical shirt. Those who register after Aug. 25 are not guaranteed a shirt, but we will do our best to try and get everyone a shirt. Post-race: Refreshments for runners include fruit, trail cookies, rolls, chips, other food goodies, water and sports drink. Craft beers from Iron Horse Brewery also will be sold at a beer garden in the finish area. Awards: Top three finishers in each age group will receive awards. Overall male and female finishers in each of the three races will receive a bottle of wine of their choice, courtesy of Vin Du Lac Winery. Timing and results: Timing is being handled by buduracing.com. Results will be posted on our website and the buduracing website after the race.